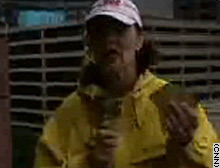 Editor's Note: As Hurricane Katrina batters the Gulf Coast, CNN correspondents file live reports from the hardest-hit areas. CNN's Jeanne Meserve reports from New Orleans, Louisiana, on Monday via videophone. Flooding here is epic. I cannot tell you what we have seen. An entire ward of the city -- the 9th Ward -- appears to be up to its rooftops in water. There are people in these houses. Clearly, the only place of safety may be in their attics. We know what that scenario means. We saw it after Betsy. People got up there. There was no way to exit. There have been bodies seen here. I haven't personally seen one, but I know others have seen at least one. It is just unbelievable. I told you earlier today I didn't think this turned out to be Armegeddon. I was wrong. This is amazing and horrifying to see. Lord only knows how many people were here. Gulfport is basically, at this time, closed off from the rest of the world. There's no cellular service, there's no phone service. There's really no way to communicate from there. That's why we had to leave Gulfport and take a drive. It was quite a trying 18-mile drive from Biloxi. It was like going in a covered wagon. Interstate 10, heading east from Gulfport to Biloxi, is covered with more refuse than you can ever imagine you've ever seen before. There are stoves, there are refrigerators, there are basketballs, there are sinks, there are toys, I mean, literally, the kitchen sink. In this town of Gulfport ... miles of the town are underwater. There's this oil drilling rig that came loose and hit a bridge -- the Cochrane-Africatown bridge. They're evaluating the sanctity of the bridge, whether or not they could open it to traffic. Government Street, one of the main east-west arteries in Mobile -- it looks as if it's grown bushes in the middle of the street. Now the vehicles you see out here should only be emergency and official vehicles because the entire city, the entire county -- Mobile County -- is under a mandatory curfew. No one is supposed to be on the street before [Tuesday] morning. And then the dusk-to-dawn curfew will remain in effect for the foreseeable future ... At night, in particular, it's going to be very dangerous until they can clear the debris, clear the downed power lines. More than 180,000 people in the Mobile area alone are without power. ...this glass is all over the streets in this part of New Orleans. In some of these buildings, every single window is blown out. It's just eerie and a real statement about the startling strength of this storm. Pieces of the glass .... are still hanging out of the windows, and there is still wind. And it is one reason why it is still dangerous to go out on the streets of New Orleans right now. This was clearly a horrific storm. Clearly there was structural damage. Clearly it is going to be a mess to clean up. But ... they were expecting Armageddon here. Armageddon, it wasn't. When we look down we can see that the water is receding. It never was terrifically deep -- I think maybe a foot at the highest point -- but it has definitely gone down. In fact we've seen police and civilian cars making their way through the waterway. We even saw a guy with a bicycle trying to ride through the water. It is a mess. Debris is everywhere. The water is just filthy with stuff that came off the buildings such as roof portions, draperies, Venetian blinds and papers. We're outside of a Winn-Dixie grocery store on St. Louis Street here, and they're literally walking out with the store. Shopping carts filled to overflowing, they even have some of their kids going in with them to get stuff out of the store, just one after the other, there must be 40 or 50 people inside, coming out of the Winn-Dixie parking lot here right now. We've also seen a lot of flooding all over the city. Many areas are completely impassible. We haven't seen any kind of structural damage yet, but we have seen trees down, power lines down, lights down, that's the kind of thing that we're seeing here. We are watching the dismantling of a beautiful town. Literally, projectiles are coming in our direction. It feels like we've got to dodge artillery. I want to give you a look at what happened to our vehicle. Five minutes ago a piece of wood crashed into our vehicle -- crashed into the window and put a hole in our window. When people hear that it's a Category 4, people start to come out. Truth of the matter is that these winds are extraordinarily strong. It is very uncomfortable to be out here and it can change on a dime. CNN meteorologist Chad Myers tells me he's got winds of possibly 110 mph, possibly 120 mph, and that's totally, totally believable. I can't imagine actually standing out in the middle of this thing. Any winds of over 90 or 100 mph are not fit for humans, that's for sure. We're standing on the street and the wind is just whipping down the street. The water is pouring down the street like waves on the top of the ocean. There are windows blown out in the buildings across the street. There are canopies that are down. Up through the manhole covers, water is just pouring down. The water is just pouring down the sides of these giant skyscrapers here, as if someone just took buckets and dumped it off the sides of the building.